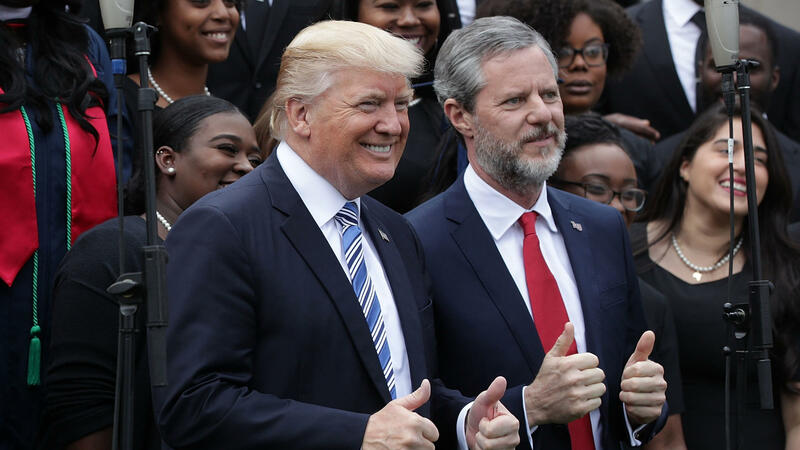 President Trump poses with Liberty University President Jerry Falwell Jr., during commencement at Liberty University May 13 in Lynchburg, Va.
Liberty graduate Chris Gaumer said that "Jerry Falwell Jr. is making himself and, it seems to me, the university he represents, complicit," with President Trump's comments about white supremacists. "We're asking that Liberty University return to its stated values and accept that the pursuit of power is leading it into some dark places, and really repudiate that," said Georgia Hamann. A group of alumni from one of the country's most influential evangelical Christian universities is condemning their school's president for his continued alignment with President Trump. A small but growing number of Liberty University graduates are preparing to return diplomas to their school. The graduates are protesting university President Jerry Falwell Jr.'s ongoing support for Trump. They began organizing after Trump's divisive remarks about the deadly white supremacist protests in Charlottesville, Va.
Chris Gaumer, a former Student Government Association president and 2006 graduate, said it was a simple decision. "I'm sending my diploma back because the president of the United States is defending Nazis and white supremacists," Gaumer said. "And in defending the president's comments, Jerry Falwell Jr. is making himself and, it seems to me, the university he represents, complicit." Trump has been criticized — including by many Republicans — for a series of statements after an anti-racist counterprotester was killed by an alleged Nazi sympathizer who drove his car into the crowd. Trump initially responded by blaming "many sides" for the violence, and then made a statement condemning white supremacists, before eventually giving an off-the-cuff statement in which he claimed that there were "very fine people on both sides." Falwell responded the next day with a tweet praising Trump's statement and adding, "So proud of @realdonaldtrump." Falwell later followed up with a tweet calling white supremacists, Nazis, and other hate groups "pure evil and un-American." Liberty University strongly supports our students' right to express their own political opinions, including any opposition they have to their school leader's relationship with this President of the US, just as other students may have opposed leadership of liberal institutions supporting previous Presidents. The tactic of returning diplomas has been used by students of many other schools to draw attention to various causes, but let's also remember that those same diplomas are quite helpful in helping these graduates secure well-paying jobs. In January 2016, Falwell became one of the earliest evangelical leaders to endorse the billionaire candidate, at a time when many conservative Christian leaders were expressing concern about Trump's multiple marriages and past support for abortion rights. Last October, some Liberty students circulated a petition opposing Trump after the release of a 2005 Access Hollywood video where he could be heard bragging about groping women without their consent. Students also criticized Falwell for defending Trump. Falwell invited Trump to give the first commencement speech of his term as president to Liberty University graduates. During his remarks, President Trump thanked evangelicals for their support at the voting booth last November. Falwell isn't alone among his evangelical peers in continuing to stand with the president. In recent days, multiple members of Trump's evangelical advisory board have publicly condemned white supremacy, though most have stopped short of criticizing the president by name. A university spokesman told NPR that Falwell "wants to make it clear that he considers all hate groups evil and condemns them in every sense of the word." "While this state of affairs has been in place for many months, the Chancellor's recent comments on the attack upon our neighbors in Charlottesville have brought our outrage and our sorrow to a boiling point. During the Unite the Right rally in Charlottesville, white supremacists, nationalists, and neo-Nazis perpetrated brutal violence against anti-racist protesters, murdering one woman and injuring many. Instead of condemning racist and white nationalist ideologies, Mr. Trump provided equivocal and contradictory comments. The Chancellor then characterized Mr. Trump's remarks, which included the claim that some of the persons marching as white nationalists and white supremacists at the rally were 'very fine people,' as 'bold' and 'truthful.' This is incompatible with Liberty University's stated values, and incompatible with a Christian witness." Georgia Hamann, a 2006 alumna and an attorney in Phoenix, Ariz., helped pen the letter. "We're asking that Liberty University return to its stated values and accept that the pursuit of power is leading it into some dark places, and really repudiate that," she said. "The word in Baptist and evangelical circles is 'repent.'... You know, truly a turning away from wrong conduct." Alumni who can't find their diplomas are being asked to sign the group letter or write individual letters to Falwell expressing their concerns. Some Liberty graduates see Falwell's association with Trump as both a personal liability and a moral embarrassment. Rebekah Tilley graduated from Liberty in 2002 and now works in higher education in Iowa. "I was to the point where I didn't even want to include my alma mater on my resume when I was applying for jobs, just because I think that can be so loaded," Tilley said. "There's such a strong affiliation now between Liberty University and President Trump that you know that reflects badly on all alumni." For Doug Johnson Hatlem, a 1999 graduate who now works as a Mennonite pastor in Ontario, Canada, Charlottesville feels like a tipping point for many alumni who have been concerned about the university's association with Trump. "It really is a watershed moment to have people openly chanting Nazi chants ... holding white supremacist signs, and carrying weapons along with all of that, and killing somebody, injuring many in the process," he said. "For there not to be an unconditional condemnation of that kind of action and behavior is just completely anathema." Johnson Hatlem said returning diplomas is an important symbolic statement. "I'll have to have my mom dig it out of storage," he said. "But I do plan to send back my diploma to Liberty." A growing number of graduates from one evangelical university are preparing to return their diplomas to protest their school's support for President Trump. Alumni of Liberty University are organizing this effort following Trump's divisive comments about the deadly white supremacist protest in Charlottesville, Va. As NPR's Sarah McCammon reports, they are specifically condemning Liberty President Jerry Falwell Jr.'s continued support for the president. 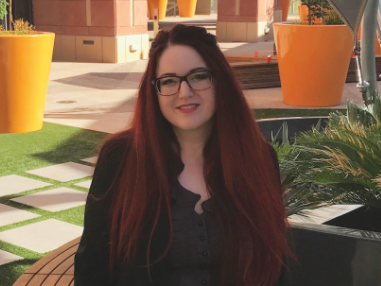 SARAH MCCAMMON, BYLINE: Liberty University in Lynchburg, Va., has long been associated with conservative politics. School President Jerry Falwell Jr. was an early evangelical supporter of then-candidate Donald Trump. Back in January 2016, just days before endorsing his candidacy for the Republican nomination, Falwell praised Trump. JERRY FALWELL: In my opinion, Donald Trump lives a life of loving and helping others as Jesus taught in the great commandment. MCCAMMON: Falwell's support for Trump has dismayed some Liberty students and alumni. Georgia Hamann is a 2006 graduate who's now an attorney in Phoenix. She says she was troubled by Trump's comments about Charlottesville. After denouncing white supremacy, President Trump later said there were some very fine people in the crowd of neo-Nazis and white nationalist protesters. GEORGIA HAMANN: When Jerry Falwell Jr. characterized those comments as bold and truthful, that really was - it felt to us like a slap in the face at a different level than what we had previously been concerned about. MCCAMMON: Falwell followed that statement with a second tweet of his own the next day, calling white supremacists, the KKK and other hate groups pure evil and un-American. Hamann says Falwell's continued association with the president is a betrayal of Christian values, an embarrassment. 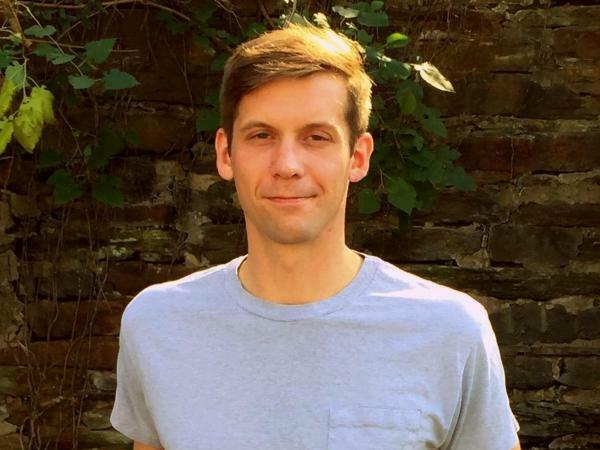 Chris Gaumer, a former Student Government Association president and 2006 graduate who still lives in Lynchburg, says he's eager to send back his diploma. CHRIS GAUMER: The president of the United States is defending Nazis and white supremacists. And in defending the president's comments, Jerry Falwell Jr. is making himself and, it seems to me, the university he represents, complicit. MCCAMMON: Yesterday on ABC's "This Week," Falwell responded to Gaumer's statement, as first reported by NPR. FALWELL: He completely misunderstands my support. My support for the president is his bold and truthful willingness to call terrorist groups by their names. And that's something we haven't seen in presidents in recent years. MCCAMMON: But some graduates say they're not satisfied with that response. Andria Chappell of Douglasville, Ga., says she plans to sign on to a group letter from multiple concerned alumni. She wants to send Falwell this message. ANDRIA CHAPPELL: We're just not going to sit down and just accept what you say because you're the president of the school. We do have a voice. And we want to be heard. And we want to be respected. MCCAMMON: Liberty alumni are organizing their protests through word of mouth and a Facebook group that's been growing larger in recent days. They're planning to put their letters and their diplomas in the mail on September 5. Sarah McCammon, NPR News. (SOUNDBITE OF KIASMOS'S "LIT") Transcript provided by NPR, Copyright NPR.